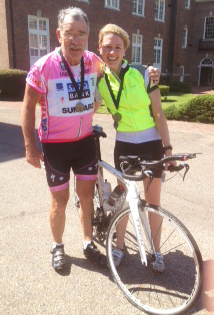 Samford University’s April 20 Old Howard 100 bike ride shattered participation records with 288 registrations. The ride’s total charitable donation will rise accordingly, easily surpassing the previous record of almost $4,000 from 250 registrations in 2011. The ride, sponsored by Samford's Howard College of Arts and Sciences, begins and ends each year in Marion, Ala., where Samford was founded as Howard College in 1841. Since the ride's founding in 2005, it has raised almost $30,000 to support Sowing Seeds of Hope, which seeks to improve the quality of life and work in Perry County through better education opportunities, health care, tourism, transportation and economic development. The ride through Perry, Hale, and Dallas counties, attracts cyclists of all skill levels, many returning every year to enjoy countryside and small towns important to Alabama's history. Riders can choose routes of varying lengths, including the 100-mile stretch that cyclists tackle each year. Starting with the 2013 ride The Old Howard 100 is part of the Alabama Backroads Cycling Century Series. The new series of 10 rides seeks to promote the growth and development of long-distance cycling in the state of Alabama, encourage participation in established Alabama century (100-mile) rides, recognize and reward individuals for their accomplishments, and benefit the charities and advocacy efforts supported by each of the events. Roger Weston of Fairport, N.Y., completed three of the Backroads rides, including Samford’s, while visiting grandchildren and daughter Tracy Weston, a University of Alabama professor. “I have been fortunate to meet some great people and outstanding cyclists at each of these events, which enabled me to finish each in about five-and-a-half hours or less,” Weston said. The 67 year-old cyclist offered special praise for fellow rider Beth Barry, who eased the final 80 miles of the Old Howard 100 by shielding him from the day’s headwind. Weston said he will cherish his Old Howard century medal and new friends, but the history and beauty of the ride made an especially strong impression. “The cemetery and large oaks covered with the Spanish moss in Selma and the churches and old southern homes are what I will forever remember,” he said. Judson College student and century rider Elizabeth Velazquez closed the event just before sunset, with organizers escorting her with flashing car lights the last 15 miles to the finish line.